This was apparently a bad killing spree rather than, y’know, their regularly scheduled weekend killing spree that happens all the time and we tend to ignore it because protagonist! Bonnie and Stefan are still looking for Damon and Enzo and Bonnie is succumbing to utterly bleak despair, clinging to the memories of Enzo and her to try and convince us that this relationship wasn’t made up with no basis after one of the writers got into the hard drugs and everyone was still desperately trying to find an excuse to keep Enzo around because he was too hot to dispose of. Stefan can Caroline are now a thing in their on again off again on again off again on again off again romance. Caroline and Alaric still co-parent their (kinda) little girls and have new nanny Selene to help patch things up. I have to say Caroline and her desperate attempt to organise everything and her constant worrying and fretting to be the only character I’m still invested in. I mean, I like Bonnie, but I honestly just want her to leave Mystic Falls so far behind her that she’ll forget everything about this place. Alaric has, somehow, taken over the running of the Amoury (and has inherited a pair of interns) to try and find out how everyone escaped from the evil basement. They do find a magically hidden tunnel which leads to a vault full of surprisingly preserved shinies. Shockingly, exploring the secret hidden basement doesn’t get them all eaten by evil things. Honestly that’s practically a rule! You can’t have people discover secretly hidden vaults an not have them eaten by zombies, cursed or at least have to wash off some primordial ooze. Turns out vampire blood can cure a slit throat but not a chewed out tongue. These leads to some house moving with Alaric moving into Caroline’s childhood home and Caroline moving in with Stefan. It all goes waaaaay simpler than it should. 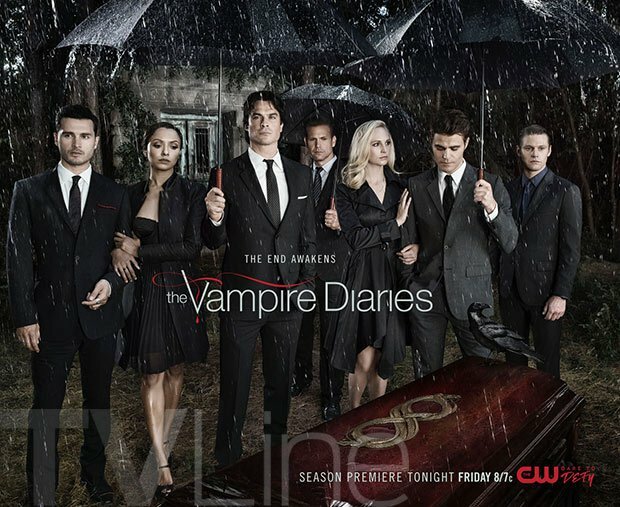 Following leads and trails of bodies, Stefan and Bonnie do eventually find Damon and Enzo. It doesn’t help that Enzo, while still human, also tells them to go. With Stefan holding Bonnie’s throat (really people have threatened Bonnie’s life so many times that she must be positively blasé about it by now). Who just finishes her last meal, provided by Enzo and Damon – and arises from her little bloody pool. Ok, I can’t say I predicted a siren, so points for that. The rest? I don’t know. I’m just so uninvested in so many of these characters and the whole horror of being forced to kill lots of evil people when this show already has a death count on par with the entire population of Virginia fails to strike a major chord with me.